Radiesse® is a long lasting injectable dermal filler that is FDA approved for the correction of moderate to severe folds and wrinkles of the face such as naso-labial folds and marionette lines around the mouth and creases of the forehead. It can also be used to augment the chin, cheeks, brows and effect contour changes of the nose and jaw line as well as fill in contour irregularities, deficits and scars. By increasing soft tissue volume in areas, it can serve to rejuvenate one’s appearance. Another area where it has been employed effectively is in the back of the hands which is useful for individuals with thin, atrophic and aged skin. 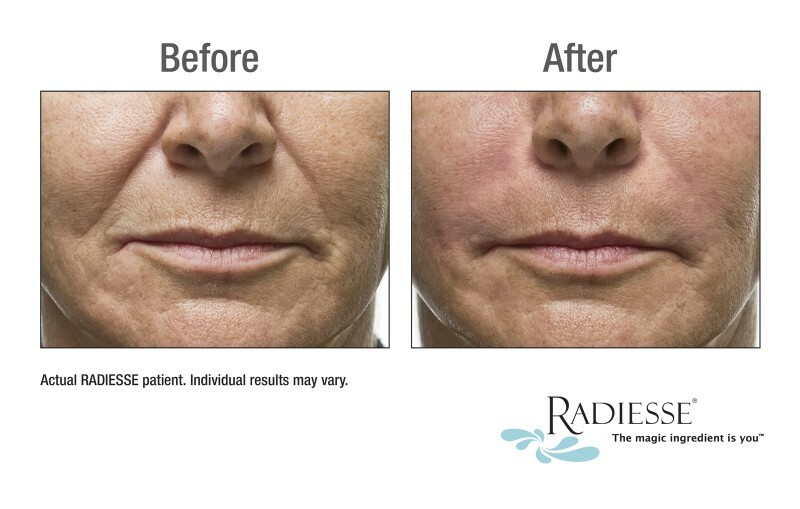 What is in Radiesse®? It is composed of calcium hydroxylapatite (CaHA) microspheres suspended in a proprietary biocompatible non-allergenic gel that can easily be injected to obtain the desired results. CaHA is the same material found in your teeth and bones. Not only does it provide volume by its presence but it also stimulates the body to produce collagen (protein) resulting in long lasting results. The injections generally are not associated with much discomfort and can be performed in the office without the need for nerve blocks. The results are seen immediately and can be quite dramatic. Swelling is fairly minimal and typically subsides within 24 to 36 hours. How long does Radiesse® last for? The duration of the results does vary depending on a variety of factors but somewhere between twelve to eighteen months is fairly typical which significantly exceeds the results of the hyaluronic acids such as Juvederm™, Restylane® and Perlane®. Touchups will often be needed during this period of time to help maintain the results. If you would like additional information on Radiesse®, Juvederm™, Botox® or on any plastic surgery procedure or service that I perform or to schedule a consultation with me, you can call my office at 480-451-3000.